Can it possibly get any bigger than this? 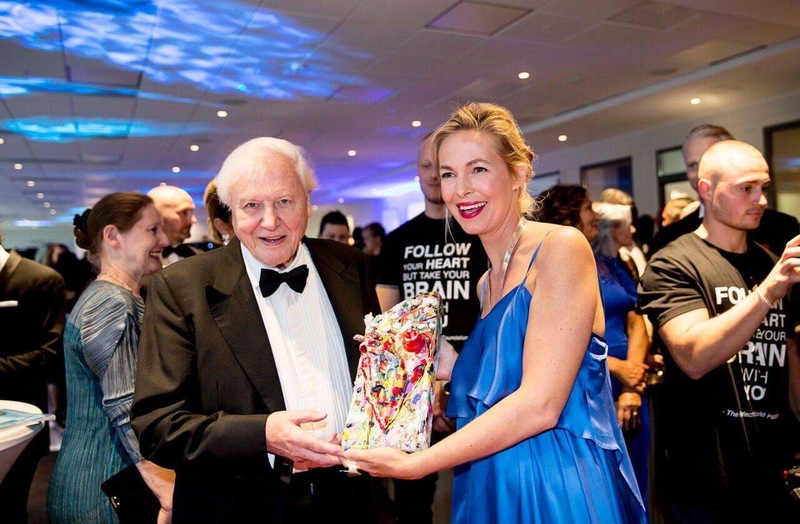 Absolutely star struck while handing over “Göteborg” to the one and only Sir David Attenborough. Just as I did last year when Dr Sylvia Earle was the guest of honor at the gala. On commission I had sculpted a piece of art from plastic waste from the ocean. I sincerely hope that this will be a good memory of the day for this amazing man! Indeed it was an inspiring day! Listening to global celebrities such as Sir David Attenborough, Nobel Prize recipient Dr. R.K Pachauri, Sarah The Duchess of York, Palle Stenberg from Nudie Jeans and many more at Gothenburg Botanical Garden. It was incredibly interesting to get their views on the acute situation for our climate and to discuss what we can do to reduce the impact of these climate change issues. We spent the evening at Elite Park Avenue Hotel where the one and only Sir David Attenborough received the award “The Conservationist of the year”. Thank you The Perfect World Foundation for letting us be a part of a better future and thank you for this wonderful picture Petra Björstad.